Fire Snakes (originally parsed Firesnakes) are long, snake-like creatures with bodies made up of fireballs. They have appeared as uncommon enemies in several Mario games (mostly in desert-themed levels). Firesnakes first appear in Super Mario Bros. 3 in Desert Land. If a Firesnake sees Mario, it begins to chase him by bouncing and trying to collide with him. A Firesnake can only be defeated by either being hit by a Shell or Hammer, by having Mario touch it while he is invincible, by being hit by Mario's tail as either Raccoon Mario or Tanooki Mario, or a stomp from Statue Mario. He can also lead them into a pit (though they reappear after a few seconds). In the original NES version, Firesnakes do not have eyes, whereas they have them in Super Mario All-Stars and Super Mario Advance 4: Super Mario Bros. 3. In Super Mario World, a Fire Snake variant appears in the Special Zone stage Outrageous. As it hops along, it leaves behind small, indestructible fires that fade away after a few seconds. 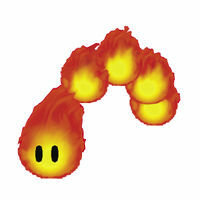 Firesnakes in New Super Mario Bros.
Fire Snakes also appear as uncommon enemies in New Super Mario Bros. in World 2-5. These Fire Snakes try to attack Mario by chasing him while bouncing, like in Super Mario Bros. 3. The Fire Snakes of New Super Mario Bros. can be defeated by a Shell or by being touched by Invincible Mario or Mega Mario. Like in Super Mario Bros. 3, they can fall into an abyss and reappear up to two times after a few seconds. They are depicted with eyes similar to re-releases of Super Mario Bros. 3. Fire Snakes reappear in the game New Super Mario Bros. Wii, acting like they did in New Super Mario Bros., but with a new ability. After one or two hops, their heads enlarge, then go back to normal size. They only appear in World 2-3 and can be defeated with a Starman or ice balls. 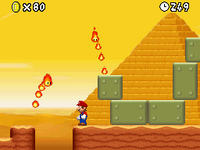 Fire Snakes reappear in the Nintendo 3DS title New Super Mario Bros. 2. 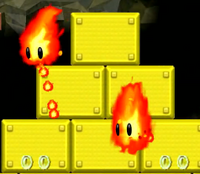 This time, they also appear in lava-themed levels, and behave the same as they do in New Super Mario Bros. They appear in World 2-4 and World Star -7. Fire Snakes reappear in the Wii U title New Super Mario Bros. U acting exactly as in New Super Mario Bros. Wii. They have their own level called Fire Snake Cavern located in Layer-Cake Desert in which they are very common alongside the Fire Bros., and can now be eaten by any Baby Yoshi. Fire Snakes are also pushed back if Mario uses a Glowing Baby Yoshi. Firesnakes make a few minor appearances in The Adventures of Super Mario Bros. 3. In "Princess Toadstool for President", Mario and Luigi end up in Dark Land and while there, they get ambushed by many enemies, including a Firesnake. In "Crimes R Us", the Koopalings break in to the Mushroom Kingdom Treasury, using a Chain Chomp to open the barred window, a Ptooie to blast a hole in the wall, and a Firesnake to bust a hole in the roof. In "Recycled Koopa", a Koopa Zombie attacks Luigi with three Firesnakes which get out of his case. In Double Trouble, a swarm of Firesnakes can be encountered in the Koopahari Desert if Mario decides to take a shortcut to Fort Koopa. Depending on how an accompanying puzzle is solved, Mario either dodges and escapes them, or is sent running after being singed twice, losing his Super Mushroom in the process. Far fewer Firesnakes can be encountered on the main road to Fort Koopa, and Mario can easily avoid them. Two Firesnakes appear as competitors in the International Mushroom Games in Leaping Lizards, being members of a team called the Sneaks. During the Beetlebowl, an all-team game, they may (depending on who the reader chooses as their offensive line) leap into the middle of the ring when the event begins and flare up, blinding everyone nearby besides Roy Koopa and their Rocky Wrench teammate, due to their sunglasses. When one of the Firesnakes grabs a Hoopster and tries to dunk it into the Mushroom Kingdom Royals's bucket, Mario unintentionally stops it when the Mushroom King (who had been turned into a rabbit) hops by, causing him to sneeze and blow the Firesnake out. What other events the Firesnakes compete in besides the Beetlebowl are unspecified. In Koopa Capers, Wendy O. Koopa, needing some Firesnake scales for a potion she is brewing, captures several and locks them in a freezing cave in the Magma Pits, causing them enter a catatonic state and begin shedding. In Yoshi's Safari, only two Firesnakes appear as mini-bosses. They are defeated by blasting them repeatedly with the Super Scope. 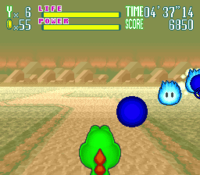 Unlike other appearances, they are composed of a string of blue Lava Bubbles in this game, and instead of jumping, wind around rapidly like an actual snake. In Mario Kart DS, Fire Snakes appear on Desert Hills. In Desert Hills, they are fired from the Angry Sun in the sky and hop along the track for a short time. Fire Snakes appear on two courses: Desert Hills from Mario Kart DS and Grumble Volcano. In Grumble Volcano, they are found near the end hopping out of pipes on the side of the course. If a racer comes into contact with one, the racer spins out. Fire Snakes reappear in Mario Kart 8 and Mario Kart 8 Deluxe as obstacles for the racers on Wii Grumble Volcano, which returns from Mario Kart Wii. 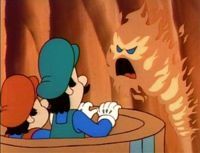 Fire Snakes were written into the desert sequence of the Super Mario Bros. film, but were cut for unknown reasons. Scripts state that they "[...]resemble moray eels, their mouths filled with pointed piranha-like teeth," and that "They gnaw through the skin, burrow into the body cavities, and lay their larvae. It can take weeks for the host to die." Earlier scripts had given this description to "Sand Eels" which similarly did not appear in the final product. In the final cut, a neon sign labeled "Fire Snake" can be seen during the establishing shot of Dinohattan. In the premade world for the Super Mario Mash-Up Pack in Minecraft, 3D pixel art of a Fire Snake appears in the desert. ↑ von Esmarch, Nick. 2012. New Super Mario Bros. 2 Prima Official Game Guide. Page 30. This page was last edited on April 6, 2019, at 00:40.